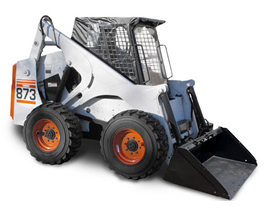 Outdoor Cover Warehouse Forklift Covers are built to demanding quality specifications. Whether you are trying to protect your equipment or your operators, we have the right solution for the job. Our covers provide year round protection from the harshest elements that nature can dish out. Whether its punishing UV rays, rain, snow, or ice, every one of our covers is designed and manufactured to perform season after season for years to come. 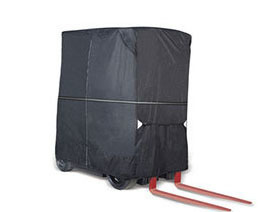 Innovative features, fabric and fit are found in all our Forklift covers. Forkshield is great for keeping the wind and debris off of the operator. 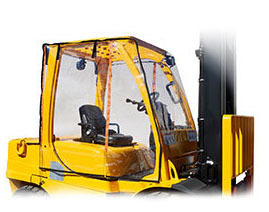 You can strap it on the front of the forklift and use it for a windshield or strap it on the top for a clear canopy. This is a low-cost item that delivers great results. This forklift enclosure is fantastic and it fits every lift on the market. 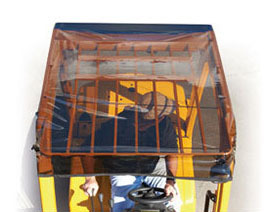 Custom made of super clear material that wraps around the forklift cab, offering great protection, while protecting the operator from the elements and maintaining outstanding visibility. This is a must item for any warehouse or yard where weather is a factor.